The International Teaching Summit 2015: Have the PISA Testers Gone Soft? A funny thing has happened to the Organization for Economic Co-operation and Development (OECD) Education Office on its way to the fifth annual International Summit on the Teaching Profession (ISTP 2015). An ambitious international movement, initiated in March 2011 in New York City and dedicated to “Improving Teacher Quality Around the World” now sounds ‘warm and fuzzy’ on those professional issues that really matter – building better teachers, improving classroom instruction, and ensuring teaching effectiveness. The ISTP 2015 agenda is clearly the work of three influential education experts, the formidable Schleicher, Ontario’s ageless education change wizard Michael Fullan, and Stanford University education professor Linda Darling-Hammond, passed over in 2008 by President Barack Obama in his choice for U.S. Secretary of Education. Two of the three in that troika have spent their careers urging governments to invest in teachers and enhance professional support programs rather than to focus on student and teacher accountability. Since Canada has no federal Department of Education, alone among the leading OECD countries, the titular head of our national delegation and host of ISTP 2015 will be Alberta Education Minister Gordon Dirks, currently serving as Chair of the Council of Ministers of Education of Canada (CMEC). Dianne Woloschuk, President, Canadian Teachers’ Federation, will be at his side, modelling the collegial partnership model so common in the higher echelons of Canada’s provincial and territorial school systems. The Alberta Teacher Summit is particularly focused on promoting the so-called “learning partnership” between “education ministers and teacher’s union leaders” and that is obvious from the media releases and invitation lists. While Mike Cooper of the Toronto-based Learning Partnership is on the planning team, the only visible partnerships with business are with the leading “learning corporations” like Pearson International and SMART Technologies who tend to underwrite most of the sessions promoting their systems, products, and curricula. The Great Powers will be represented by Arne Duncan, United States Secretary of Education, and Hao Ping, Vice Minister of Education, Peoples’ Republic of China, although much of the agenda runs counter to their current ‘higher standards’ educational reform priorities. Judging from the laudatory treatment of Finland in the ISTP 2015 policy brief, Krista Kiuru, Minister of Education and Science, will be there to provide fresh evidence of the superiority of Finnish teachers and their extraordinary professionalism. Even though Finnish students have slipped on recent PISA tests, that system continues to be the “holy grail” for teachers opposed to regular student testing and school choice of any kind. Anyone looking for specific policy measures to improve the quality of teaching will be disappointed with the official menu. The ISTP2015 brief and the results of TALIS 2013, the 2013 OECD study of teacher competencies and perspectives, which included 20 teachers in each of 200 schools in Canada, focuses on ways of strengthening teachers’ confidence levels and helping them to overcome “risk-aversion” to innovation. After five consecutive years of Summitry, it is high time to get into the real nitty-gritty and build actual classroom teachers into the process. From the outside looking in, the Summit resembles a gathering of education ministers and system insiders who purport to know what’s best for teachers as well as students in today’s classrooms. In other words, a high altitude “risk-free” summit. Two fundamental questions arise: Whatever happened to all the recent independent research calling for major reforms to teacher education, professional standards, and classroom accountability? And most importantly, where are the exemplary classroom teachers on that star-studded international guest list? Violence and Bullying in Schools: Who’s Doing What to Whom–and Why? Safe School initiatives and “No Tolerance” policies have been around since the mid-1990s, but school boards and provincial education authorities across Canada are now collecting and beginning to publicly report on acts of school violence. It’s also headline news because of startling figures, inaccurate reports, and hair-raising tales of violence against teachers. Nova Scotia Teacher’s Union president Shelley Morse topped them all in February 16, 2015 in a CBCNews Nova Scotia report. “I’ve been kicked, punched, bitten. Had chairs and desks and rocks thrown at me, ” she said. “I’ve had students spit on me. Have been verbally abusive to me. They have destroyed my office, because I’m a vice principal as well.” Teachers, Morse claimed, call the NSTU in fear of their students it gets so bad at times. Cracking down on school violence is not new. It goes back to 1994, when American President Bill Clinton passed the Gun Free Schools Act banning guns from public schools and cracking down on school violence. After the 1999 mass shooting at Columbine High School in Littleton, CO, the majority of U.S. schools adopted “No Tolerance” policies for violence, tobacco, alcohol, drugs, firearms, and weapons other than guns. Since then, Canada’s provincial school systems have adopted their own versions of such policies aimed at combating bullying, managing youth violence, and controlling unwanted aggression. Twelve years ago, when British Columbia Premier Christy Clark was Education Minister, a government task force called for province-wide policies for dealing with bullying, harassment and intimidation in schools, including annual reports from school boards on how they handled violent incidents. Since then, safe school policies in many urban schools in Ontario have featured security guards, electronic surveillance, student identification tags, discipline, and zero tolerance. Implementing simple “No Tolerance” policies ran into unexpected difficulties. In 2000, the Ontario Ministry of Education passed the Safe Schools Act, which set out a list of offences that could trigger expulsion, suspension, and other disciplinary responses. Interestingly, it did not define safety. In a parallel move, the Toronto District School Board (TDSB) adopted The Equity Foundation Statement in 1999 – a comprehensive commitment to equity and a rally against racism, homophobia, sexism, and oppression based on class. Those two initiatives have, in effect, exposed differences in students’ and teachers’ perceptions of safety and equity, and how they experience bulling and harassment on a day-to-day basis. Public disclosure of violence and bullying is now far more common. In 2011, Ontario’s Ministry of Education responded to public concerns by amending the Education Act and requiring the 73 school boards to report the numbers for incidents like weapon possession, serious assaults and sexual assaults in its schools With the passage of the Nova Scotia 2012 Respectful Schools Act, reporting acts of violence became mandatory in public schools. The official figures for acts of violence in school can be alarming. Last year teachers, principals and school staff in Nova Scotia recorded 4,730 acts of physical violence in a provincial system with only 400 schools, 122,000 students and 9,300 teachers. So shocking, in fact, that Minister of Education Karen Casey attempted to downplay the figures. “I think it’s misleading to suggest that 4,700 of those are truly violent acts,” she told CBC News. She thinks there’s a distinction to be made between students with emotional or mental difficulties acting out and students who are intentionally violent or aggressive. The posted data from the Ontario school boards has generated much controversy. In 2011-2012, 2,659 violent incidents were reported from almost 5,000 different schools. In 2012-2013, 2,188 incidents are listed. Judging from the Nova Scotia disclosures, those figures look to be remarkably low. The Ontario school boards were later found to be under-reporting or inaccurately reporting their incidents of violence. The Peel District School Board, appears to lead the pack with 641 total incidents in 2011-2012 and then again in 2012-2013 with 478. The largest board in the province, the Toronto District School Board reported only 177 incidents in the first year and 178 in the second year of tracking the incidents. York Region, which is around the same size as Peel, reported 30 incidents and 38 incidents. In all, 10 of Ontario’s 73 school boards reported no incidents in 2011-2012, and 11 reported no incidents in 2012-2013. Twenty boards reported less than 10 incidents in 2011-2012 and 22 boards report less than 10 incidents in 2012-2013. After Stu Auty, founding president of the Canadian Safe Schools Network, raised concerns about the accuracy of the reporting, and the Ministry of Education eventually conceded that the numbers were problematic for comparative purposes. Trafficking drugs the Peel public schools, for example, was reported to the province as a violent incident, even though it lay outside the reporting guidelines. A quick look at the figures highlighted a number of other irregularities. In 2011-2012, the Hamilton-Wentworth District School Board reported 191 violent incidents. The next year, it reported zero. A series of school disciplinary policy changes have been implemented over the past 20 years in an attempt to curb violence in schools and to stamp out bullying in hallways and playgrounds. Whatever happened to the Zero Tolerance and Safe Schools policy initiatives? Are acts of school violence and bullying escalating as much as is being reported? If one out of ten acts of violence are directed toward teachers, is that a worrisome trend? How reliable are the current school violence reports as a basis for framing school discipline policy? School Snow Days: What Can Be Done to “Make-Up” for Lost Learning Time? School days lost to winter storms and other calamities is back on the public agenda, particularly in Atlantic Canada and the northeastern United States. It broke into the open only when the numbers of lost days were approaching two full weeks of school. After shrugging off the issue for years, a couple of Canadian Ministers of Education suddenly went into a panicky, reactive mode. All of a sudden, recovering “lost learning time” became a priority. A succession of severe snow and ice storms in late February 2015 finally spurred that intervention. After New Brunswick’s Education Minister Serge Rousselle announced he was looking at adding “make-up” days, his Nova Scotia counterpart, Karen Casey, shocked everyone by sounding a public alarm bell. In a media scrum, Casey drew what sounded like “a line in the ice” and openly mused about sending students and teachers to school on Saturdays and during March break to make up for lost days. It caused such a furor that Premier Stephen McNeil was forced to intervene, assuring worried parents that the province was not going to commandeer their upcoming holidays. Since a Nova Scotia Snow Days report by Dr. Jim Gunn in November 2009, five years ago, many concerned parents and citizens were asking –what’s really changed? Aside from minor policy adjustments and clearer communications, very little had happened to address the fundamental issue – the erosion of learning time and its impact on both student engagement and achievement. Compared to Nova Scotia and the neighbouring Maritime provinces, American state governments and school districts have done much better. Transforming School Snow Days into E-Learning Days opened the door to what are known as “Blizzard Bags.” With a storm approaching, teachers are prepared with class-based homework assignments, inserted in special bags, to ensure continuity in teaching and learning. Last winter, one of the most severe ever, Nova Scotia school boards cancelled between 5 and 15 full days, the highest numbers since 2008-09. So far this season, the number of “lost days” totals from 5 in Halifax to 11 in Cape Breton, with a month of winter still ahead of us. Connecting the dots leads to one inescapable conclusion: Students in Nova Scotia, as well as New Brunswick and Prince Edward Island, would be doing better if they actually spent more time in school and were expected to complete work now being “written-off” in our public schools. Cancelling whole school days for real or threatened severe weather, then allowing between 12 and 16 days to be consumed by “Teacher Days” for professional activities was only compounding the student performance challenges. No school system anywhere can be competitive when students are only in school for 165 to 175 of the scheduled 180 to 182 instructional days. Over the past five years, students outside of Halifax have actually missed 40 to 55 full days of school as a direct result of storm closures, double that of those in the HRSB, putting them at a real disadvantage compared to city kids. The pattern was similar in both New Brunswick and Prince Edward Island. Raising such critical matters is no longer about finding fault, but rather about appealing for constructive policy changes to alleviate or minimize student learning loss in relation to other provinces and states. If “E-Learning Days” cannot be implemented because of the uneven state of Internet and home computer access, simply shrugging it off is no longer tenable. The American ‘Snow-Belt’ states are way ahead of Maritimers in tackling the problem of repeated school day cancellations. Confronted with the problem, good old “Yankee ingenuity” sprouted up in Ohio, Minnesota and New Hampshire. Creative solutions are now appearing in the Greater Boston area, where school superintendents have stepped up to meet the challenge. The state of Ohio was first out of the gate. Five school days a year were designated “Calamity Days” to accommodate storms, power outages, tornadoes, and local events, including fires, roof leaks, and boiler problems. Lost days, above 3 days, then later 5, were re-claimed by alternative means, including E-Days, replacing PD days or adding ‘make-up’ days at the end of term. E-Learning Days emerged over the past five years as a popular alternative, employed in some 200 Ohio schools, mostly in rural and remote school districts. Given the choice between providing E-Learning activities during Snow Days and giving up PD or holiday time, teachers warmed to the concept and it was incorporated into the school’s curricular program. The wintry blast of 2014 wreaked havoc in the state school system and ultimately claimed the Calamity Days model. When school day cancellations exceeded nine days, Ohio schools were unable to guarantee the mandated minimum of 180 days without pushing the school year into the final exam period. In September 2014, Ohio shifted from mandating school days to setting minimum annual hours of instruction, specifying 910 hours of instruction for K-6 and 1,001 hours for 7-12, and permitting more flexibility in implementing replacement days. Ohio’s Calamity Days were ahead of the curve and states like Massachusetts, New Hampshire, and Maine have taken different approaches. In the Greater Boston area, Burlington City Schools, are now leading the way – providing students with Blizzard Bags and the option of completing work online or in traditional fashion. 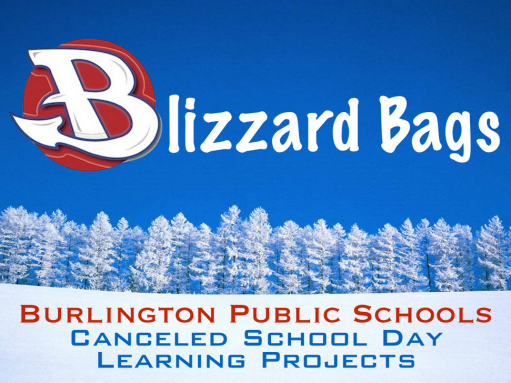 Building and developing an effective Snow Days Alternative program is not easy, but Burlington Public Schools are proving that it can be done. Assistant Superintendent Patrick M. Larkin was “underwhelmed” with Blizzard Bags from a cross-section of Ohio schools that were stuffed with worksheets and rather mundane homework assignments. Working with teachers, Larkin has ensured that Blizzard Bags are now being filled with more challenging assignments requiring independent thinking, collaboration, digital learning, peer feedback and teacher guidance. What’s standing in the way of re-claiming lost School Snow Days? Should provincial and state education authorities establish a minimum number of days when students will actually be in the classroom? If so, what type of a school calendar and schedule would be best for conserving and protecting instructional time? Where have school districts actually succeeded in limiting the erosion of student learning time?